1 MAY 2014 (WORLDWIDE): The Pixel Project and Guy Gavriel Kay, award-winning bestselling author of The Fionavar Tapestry trilogy and Sarantium diptych, are proud to jointly present the Double Drabble Pixel Fundraiser in support of the Celebrity Male Role Model Pixel Reveal campaign which aims to raise US$1 million in aid of The Pixel Project and the National Coalition Against Domestic Violence. 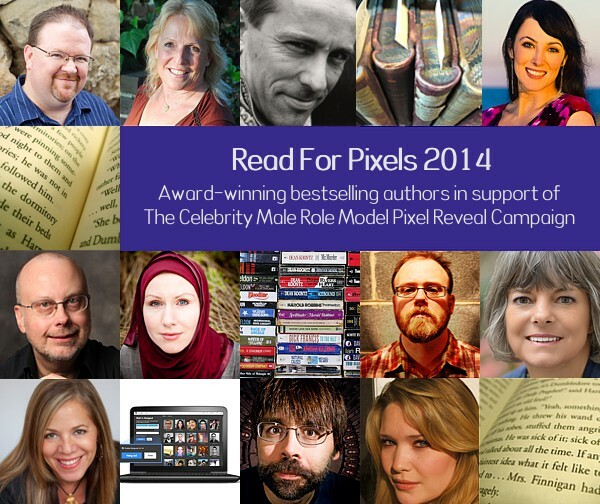 The Double Drabble Pixel Fundraiser will run from 1 May – 14 May 2014. Mr Kay has written two exclusive 100-word Drabbles (100-word stories) for The Pixel Project. One takes place after the conclusion of his Sarantine Mosaic, two novels inspired by 6th century Byzantium. Because this has an implicit ‘spoiler’ effect for those who haven’t read the books, he is also offering a Drabble that takes place before the opening of The Summer Tree, the first volume in his high fantasy trilogy, The Fionavar Tapestry. There is a motif that links both Drabbles. Donors who donate US$50 will have a choice of one of the Drabbles and donors who donate US$75 will receive both Drabbles. Supporters are happily urged to acquire both Drabbles at the discounted donation level and they can make their donations online via the Pixel Reveal campaign donation page (http://reveal.thepixelproject.net/buy-pixels/) or the Razoo donation page for the campaign (http://www.razoo.com/story/Pixel-Reveal). All donors will be sent their Drabble(s) within one week after the end of the fundraiser. The Pixel Reveal campaign rallies the global audience to unveil an online million-pixel mystery collage of world-exclusive celebrity male role model portraits by donating US$1 per pixel. For example: the $75 donation would reveal 75 pixels. As more pixels are revealed, the cover picture will fade out to uncover the portraits underneath it. When a celebrity male role model is fully revealed, an exclusive anti-VAW public service announcement from him will be launched to help trigger conversations about VAW and inspire men and boys to take action to stop VAW. The distinguished line-up includes a Nobel Laureate, a two-time Pulitzer Prize Winner and superstar Environmentalist. Guy Gavriel Kay is the author of twelve novels (most recently River of Stars), and a book of poetry. He has written book reviews and social and political commentary for the National Post and the Globe and Mail in Canada, and The Guardian in England. Translations of his fiction exceed twenty-five languages and his books have appeared on bestseller lists in many countries. Kay has spoken and read on behalf of his publishers and at literary events around the world. He was been nominated for and has won numerous literary awards and is the recipient of the International Goliardos Prize for his contributions to the literature of the fantastic.